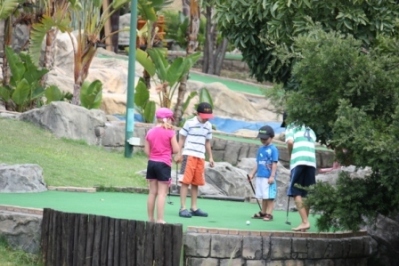 Cape Town's weather allows one to play putt putt quite regularly. This is a family activity that can be enjoyed by both young and old alike. The course at this venue (Also known as the Bells Academy) consists of three nine-hole courses. The 27 holes vary in lengths from 15 - 30 metres. The course is situated next to the beach offering great views over the ocean. Their are two 18-hole courses of varing difficulty and it takes approximately 45 minutes to complete a course. 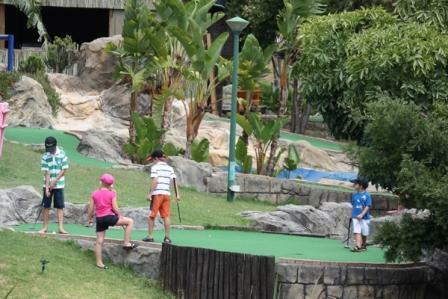 Cave Golf is an indoor course offering 18 holes and is situated at the V&A Waterfront.